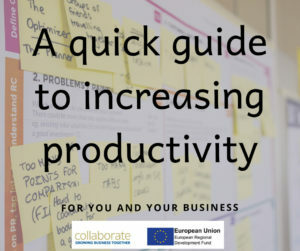 The Collaborate project is supporting small and medium-sized businesses in Leicester and Leicestershire with business advice and sector-specific workshops. More details here. Below we’ve written a few short blogs to support business owners in some areas which can often be challenging when you are doing things yourself. If you have any suggestions for articles let us know. A PR template? – There’s no such thing! Dewi Hughes is founder and MD of Silverlock Tenders, one of the largest tender writing and fundraising companies in the Midlands. Prior to setting up Silverlock in 2009, Dewi spent 21 years working for the Government which included 12 years appraising bids for funding, 4 years writing for over 50 government ministers and 4 years managing large EU funded projects. 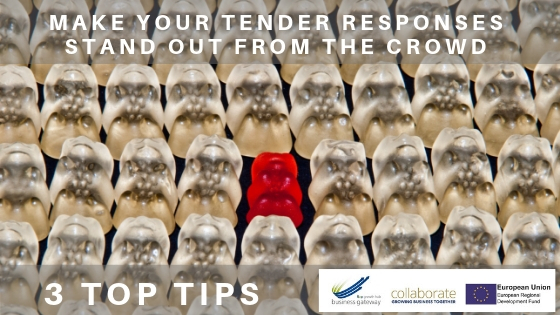 Below Dewi explains how to make sure your tender response makes it to the top of the pile. You’ve identified an opportunity to bid for some work that would suit the skills, knowledge and experience of your business. It’s practically in the bag then, right? Well, not always. We have had many years of experience in both writing and assessing bids, and there are a number of things we have learnt from both processes. Here are 3 key tips to help you write a tender that is easier to read, that better highlights the reasons why you are right for the job and ultimately makes it easy for the buyer to choose you. You may assume that evaluators read everything that you submit. This would be unusual, as they are often under time pressures to complete the evaluation process. Most people take around two to three minutes to read 500 words, which is around one side of A4. Evaluators typically have around one minute to read this much text, so they are forced to skim-read the material. We, therefore, recommend that you keep your answers concise, relevant and interesting. For the same reasons as above, and to help the evaluator to connect with your bid, you must make the document easy to navigate. One of the easiest ways to do this is to use clear headings and subheadings that relate to the questions in the tender. Headings are like signposts that give clarity to the evaluator – so they know that you are giving them exactly what they asked for. The headings should also follow the order in which things were asked for – so the evaluator doesn’t waste time looking for an answer. There is nothing more intimidating than a page full of solid writing. Most tenders will include word or character counts for each question, but that doesn’t stop you using formatting to help present an attractive document that doesn’t look daunting to the evaluator. Bullets and numbering are a great way to highlight important information. Keep them short and to the point, and they will also create some great white space on your document, breaking the information up. When complete, don’t forget to check the spelling and grammar, too. If your writing is full of errors, the evaluator may wonder what mistakes you will make with their project, too. Dewi will be presenting on 14 May with further guidance on how to write a winning tender along with representatives from Leicester City Council, Leicestershire County Council and others at the ‘How to secure public sector contracts’ event. View details here. Networking might be something others do but it’s not for me! Have you ever had this kind of thought? If yes, you are missing out on meeting new people who might, in time, become customers, suppliers or friends to your business. In our blog this month we ask marketing consultant, Lindsey Newman-Wood of Passion Marketing to provide her advice on how to fight through those mental monsters and get out there. “Networking for your business can seem daunting. Walking into a room full of strangers can feel nerve-racking but with the right strategy and tactics you can feel more confident in building new relationships and you can even start to enjoy it! If you’re attending a networking event, have a look at the list of people invited, and check out the social media coverage of previous events. This will help you get a flavour of the experience in advance and can help with things like deciding what to wear and what to bring with you. However well you’re getting on with the person you’re talking to, at some point you will both want to move on and speak to other people. Make this as smooth as possible by having a phrase prepared. Try something like ‘I’ve really enjoyed meeting you. I’d better chat with a few other people before I head home’ – or something similar, which suits your personal style. Social networking – the clue’s in the name! Sites tailor-made for business, such as LinkedIn, give you multiple ways to connect with people working in your industry and get introductions from people you know. There are also newsfeeds and forums where you can get join discussions and exchange knowledge on topics related to your field. Watch out for free workshops and events to meet and connect with new people through Collaborate and the Business Gateway growth hub here. 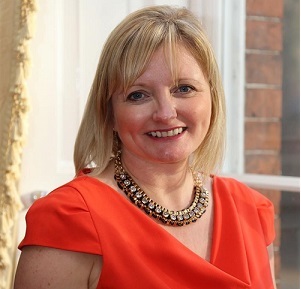 We continue our theme of PR this month with a blog from PR consultant, Louise Third who was awarded an MBE in 2016 for her services to enterprise and charity. Needing inspiration for your new business venture, you head down the pub to meet up with friends. Subconsciously stripping the cardboard beermat, you start doodling – and behold – the very ideas locked away for so long come tumbling out in a stream of bullets. My e-book PR on a Beermat was born in 2006 following a discussion and some editorial assistance from Chris. The book is due an update this year, but the principles remain the same. They underpin my workshop, and appeal to anyone needing to get cracking with their own PR but feeling strapped for ideas. You might be a little cynical about PR. It’s too closely associated with ‘spin’, expensive lunches with reporters, and leggy blondes draped across sports cars – all good fun, but not a lot of use for you and your small, ambitious but cash-strapped business. Don’t worry. This stereotype is, like most such stereotypes, miles off the truth. PR is a serious business discipline and one that can be of huge benefit to start-ups and small businesses. Don’t think you can simply issue a press release about the exciting news of your latest sale and expect coverage. Great PR starts with a plan, and preferably one that sits inside your overall business and marketing plan. Why do you need to raise your profile? What are your key messages, and who are you trying to get to? Once these are clear, you’ll be amazed at how much simpler it is to put PR into practice. A burst of PR energy at the launch of your venture will soon fade and die. I show clients how to stay noticed by drip-dripping regular news, interesting stories, comment and even personal appearances (if you fancy the speaker circuit). Building a strong, positive reputation will change people’s perception of you and the business. Should anything go wrong, and you need me in to calm a crisis, we will have lots of goodwill to draw from! Having a monthly schedule for your PR activity not only makes sense of your social postings, but means you are ready for media opportunities such as ‘ XYZ Awareness Month’. This is metaphorical noise of course. PR is not all about media coverage; another myth dispelled. You build relations with people you want to influence in multiple ways. Yes, positive editorial in print, online, broadcast or by recommendation feels good but will be bolstered by your conference speech, exhibition stand, award win, charity sponsorship, schools’ mentoring – in fact anywhere you are seen and heard in a positive light. OK. So I run a popular workshop ‘Have You Got News For Us?’ – about what is and what isn’t news, and about what editors and journalists want. In essence, I sit with a group of entrepreneurs and small business owners and teach them to think like a PR professional. News has to be topical and timely. It doesn’t have to be about big things – the appointment of someone new is news. No, it’s not headline-grabbing stuff. So don’t pretend it is; just make sure it gets into the right place in the right trade or local media. Someone will notice. News is any unusual event, like the customer with a particular problem that you solved in an imaginative way. News can also be you, but watch your ego doesn’t get in the way. It can be your story, and it can be your views if, and only if, they are original and you express them well. In PR on a Beermat, the workshop, I’ll be showing you how to pitch your story to editors, and prepare for their potential reaction. Experience is the only way to learn. Believe me. I have earned the T-shirt. Have a go. Lick your wounds. Learn. Have another go. Re-learn until you get the ‘topical and timely’ equation right. If like me, you enjoy running your business and want even more people to know about what you do, you will love PR. Book onto the LEP workshop and let me show you how to do it for yourself. A core tenet of Beermat is that ‘business is about people’, so putting public relations at the heart of your business is a fundamental Beermat lesson. Failure to do so will mean you miss out on some amazing reputation-building opportunities and allow your competition to take all the limelight. Don’t do this! Louise is running a workshop – “PR on a beermat – on Wednesday 1 May 2019 from 9.00am to noon followed by a networking lunch. Event details can be seen here and book your free place. 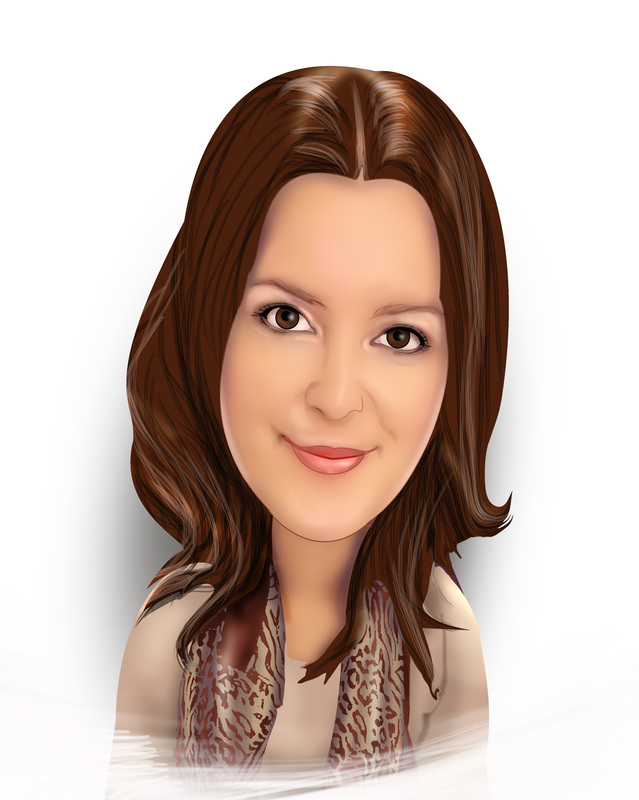 Rachel Hargrave is Agency Director at RDZ PR and a Collaborate workshop speaker. She provides some of her tips when considering your PR plan. “We are often asked to summarise what a good PR plan should look like. Well, that’s not an easy thing to summarise as it will be different for every business. There aren’t even many common points within a specific industry or business size. The PR plan is really quite personal and it will depend on factors which are very unique to the business and its owners, Board and senior management team. So, rather than make this the shortest blog ever and leave our reader(s) wanting, we thought it might be of more use to highlight what considerations should be made in putting a PR plan together and emphasise what factors are of utmost importance. Firstly, and perhaps most importantly, identify the real ‘wins’ (otherwise known as Campaign Objectives) which the business wishes to achieve through their PR strategy. For some, it may simply be the generation of new business, for others an increased market share. Examples of less obvious objectives which we have worked with include greater visibility amongst their peer group and increased attractiveness to high calibre potential recruits (including the cream of the graduate stream in any given year). Another critical factor in the ‘foundation stage’ of a PR strategy is achieving buy-in from each one of the team members who will be involved. There will be tasks and input required from all members of the team and those that are totally opposed to the occasional bit of social media posting may inadvertently cause a loss of momentum. Any good PR plan will also include set periods of review and diarised meetings of all key personnel involved. Sticking to the dates agreed is not always easy, but every effort should be made to have those diary dates as ‘immovable’ as possible. There will, of course, be flexibility but if the ‘PR review meeting’ becomes the floating date on everyone’s calendar then the necessary tweaks to strategy can be missed and render the campaign less effective than it might otherwise have been. We’re slightly nervous to say that ‘patience’ is an important ingredient in PR planning, but it actually is. A three month PR plan is very unlikely to produce desired effects but a 12-month overall plan with three-month ‘mini-campaigns’ embedded stand a far better chance of delivering on the original objectives. And finally… apologies to those who expected an actual template into which you could simply place your company name and goals and magically achieve your PR wishes – no such document exists! Business adviser Jo Bekis gives her thoughts on planning for the future of your business in our latest blog post. Succession planning should always be in your top five of continuous improvement and action planning. Done correctly your succession plan should give you a ‘line of sight’ of who is in your business, where their skill set is now and where it is heading in the future. Many SME clients do not have HR departments or even team leaders who can perform personal development reviews and one-to-ones with staff, often it is down to the business owner to undertake this role. When I perform my initial meeting and diagnostics with my clients, they do have clear thoughts and goals about who they need to recruit to meet their growth plans. But often they don’t look inwardly at their current talent pool and who is going to be the next them. Do you have a skills matrix? Do you run your own apprenticeship programme? Do you regularly upskill your existing workforce? Do you have the skills within your workforce to accommodate the growth you want to achieve? Are there clear skills gaps within your business right now? When was the last time you performed any training? Far too often I hear ‘no’ more than ‘yes’ giving me a clear outline of an ‘area for improvement’. Getting a client to embrace the power of the skills matrix, how to use it and more importantly how to effectively succession plan in line with their strategic business plans is a regular talking point within my weekly activities and it is really easy when you know how. Workforce development is a huge part of planned successful growth. To stay ahead of the curve you could utilise a number of online tools performing Gallup 12 surveys, reviewing training needs, undertaking one-to-ones and holding weekly team meetings to plan for the week ahead, mid-week reviews and end of week wash-ups. Engaging with your team on multiple levels can happen as part of the daily operations. Can you help me create a skills matrix? What if my staff do not want to upskill? Is this going to be time-consuming? I do not have time to perform staff one to one? A one-to-one does not need to be time-consuming, but any business that is engaged and embracing growth should take time to include their team as part of this, it is a vital part of growing your business. A review can be performed in just 30 minutes. You can send your team member the review before you sit down and ask them to think about the questions, preparation always makes the review easier. Ask them to think about examples of the questions so this gives you a talking point. It is amazing what comes out of these reviews. Having performed many staff one-to-ones and performance reviews it really is insightful and may just hold the answer to a problem that has been on your mind. A great example guide can be found here, but how your one to one looks is entirely up to you. If you need help with any of the areas covered in this article complete this simple online form to see if you’re business is eligible for free support from the Collaborate project. 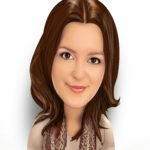 Collaborate adviser for engineering and advanced manufacturing businesses, Jo Bekis provides her thoughts. A regular question asked when I’m advising a business is about product innovation. It is high on the agenda for many advanced manufacturing companies. A couple of my clients are currently innovating their existing products or processes, due to realising they need to stay ahead of the curve. Either by identifying a gap in the market, demand is driven from their supply chain or it is derived from their continuous improvement planning. One of my clients is changing the way in which their product is used by the end user. By modifying tooling to ensure usability is easy, minimising damage to the product itself, which is often being returned as damaged. Whilst some training has reduced returns it was deemed the tooling needed to be modified. When my client started on this journey they knew what they wanted to do, but didn’t quite know how to do it. I arranged visits to a couple of organisations who could assist. I took my client to the Innovation Hub at Leicester University and the Manufacturing Technology Centre and facilitated discussion of a very confidential nature to establish if they could assist. Coupled with teams of innovation experts, research and development tax credit support and company employee ‘buy-in’ the project is pushing ahead. These types of projects are not quick fixes for businesses, they are performed for long-term gain and exponential growth. Advanced Manufacturing more than ever needs to stay ahead of the curve and current trends. They must be always looking inwardly, outwardly and at innovation. Mastering how they will next evolve within the industrie 4 revolution. If you need support with a specialist project it is always wise to bounce your ideas around with an independent adviser. Collaborate is able to give you 12 hours of fully funded business support. We can connect you with the right people quickly and ensure you keep moving forward. Complete this online form to see if you are eligible for support. Read more about Collaborate here. 1. Great internal communications – ensuring that your workforce understands what is required of them and what impact their efficient working will make to the success of the business is vital. 2. Happy employees – research has shown that a happy workforce simply gets more done than unhappy and depressed staff. You only have to look at the way productivity levels drop in businesses which are undergoing consultation on redundancies to see that. Often simple praise for a job well done can raise morale and motivation. Other things that can help ensure a happy workforce are setting achievable goals, incentive schemes and performance reviews. 4. Make all meetings productive, with short agendas and minutes containing action points and deadlines for each attendee so that everyone is reminded of what is expected of them and by when. 5. Protect a minimum of 90 minutes per day to focus on tasks that must be done (do this by turning off email and telephone calls for that period wherever possible). If your mobile is off but still buzzes, it can lead to lost concentration, if your email pings, likewise. Eliminate any distractions – such as things that pop into your head that you must remember to do – by keeping a blank sheet of paper to write them down on a list which you can attend to later. 6. Keep a clutter-free workspace so that you can see when something new has arrived on your desk. 8. Keep hydrated – a fit and healthy employee will be more productive. 9. Utilise continuous improvement or Kaizen, which is a way to make small incremental improvements to your processes; these add up to big improvements in overall efficiency and quality. 10. Adopt manufacturing processes like Lean Manufacturing, Right first time and/or Just in time – all of these can help manufacturing productivity and keep stock levels tight – sign-up for one of our workshops to find out more. 11. Adopt new technologies to save you time, for example, Messenger apps on your website, a Messenger app that can answer frequently asked questions on your behalf on your Facebook page, a live chat facility direct to the sales department on your website. 12. Use virtual reality to map out any potential changes on the factory floor or in the office and work out if they would improve your productivity. 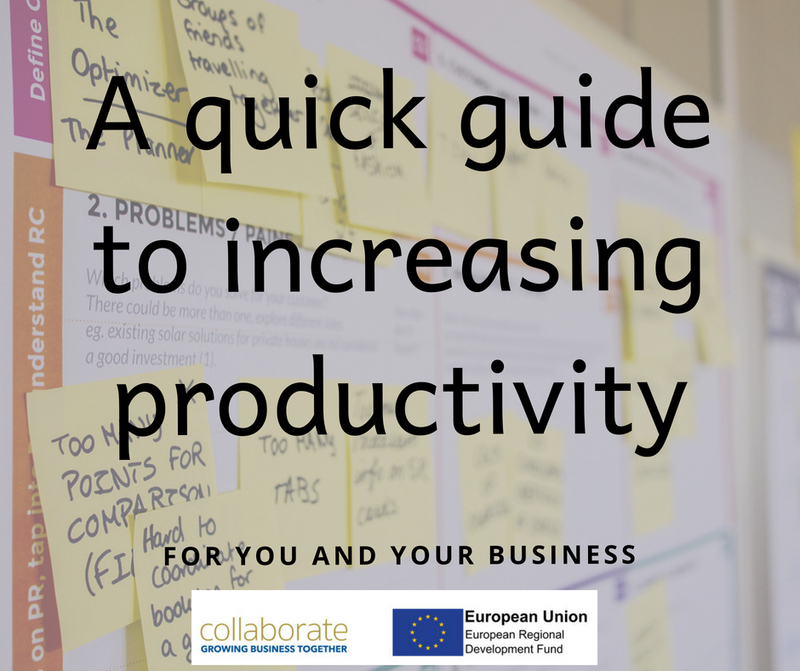 If you need help with increasing the productivity in your business contact Collaborate to see if your business is eligible for 12 hours of free business advice and workshops. Visit this page and register now. For a list of Collaborate workshops visit the events/news section or search under ‘collaborate’. In our fast-paced world, digital marketing offers SMEs the opportunity to reach more people very cost-effectively. With a professional looking corporate identity and good photography, there are things you can be doing right from the word go without spending lots of money. You may choose to access some help with some of these things, especially if you’re not particularly ‘techy’, but the reality is that with a little knowledge you can make things happen digitally! First social media – there are a number of different social media outlets, some appropriate for business-to-business, some more business-to-consumer oriented, so choose wisely and if you’re unsure, start with one and see how you get on before setting up an account with all of them. LinkedIn is the most appropriate for business-to-business organisations for example. This is your shop window, so make the most of it, complete your profile as fully as you can and on LinkedIn seek testimonials from customers as it helps to build the picture. Once your profile is set up, LinkedIn offers you a way of publishing articles, so that you can share information in-depth. Facebook is a great place to start if you’re running a business-to-consumer company. However, you should realise that customers have expectations of a very speedy response from you to any questions asked. According to a study by Nielsen, 56% of people would rather message a business than call customer service and 67% expect to message businesses even more over the next two years. Facebook Messenger does include some tools to help manage customer enquiries in a speedy way but be prepared, customers will ask questions all day and all night 365 days of the year. Facebook also allows you to create events and groups so that you can build a community of customers. If you are offering a product or service that is particularly photogenic, then Instagram is the one for you. This is an ideal forum for artistic photography to help you spread your message. Twitter is particularly good for contacting and engaging with journalists and Pinterest, like Instagram, works well for inspiring people to look at your products and allows you to link photographs through to your website. The important thing to remember is that social media should be just that ‘social’, so the tone of voice should be casual and it should feel like you’re having a chat with a friend, not trying to sell someone something. All social media has analytics tools available for business accounts, so make sure you evaluate how you’re doing and that you shape future posts by learning what has gone down well before. 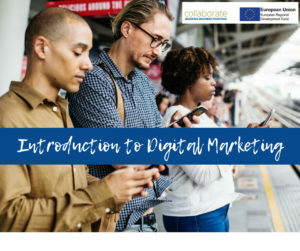 Even with the new GDPR regulations which came in on 25th May, email marketing is a powerful tool and a great reminder to customers you may not have heard from for a while that you are still there! First, you need to ensure that you have an opted-in database if you’re contacting people who haven’t enquired about you or purchased from you before. One way of collecting opted-in email addresses is to include a contact form on your website so that people who want to receive news can sign-up. Customers with whom you have a contract will expect to hear from you, and unless they specifically unsubscribe from email marketing, will usually be happy to be kept in the loop. There are emailing tools like Mailchimp which are really useful for keeping track of unsubscribers and you can create a professional looking email newsletter for free if you have fewer than 2,000 subscribers on your list. The beauty of email marketing is that you can see exactly who has opened your email, who has clicked on links and who has taken action as a result of your email, so evaluating a campaign is easy. A web presence of some sort is essential these days and is generally best produced by a professional, but if you are not looking for specific functionality, it is possible to set up your own for free using something like WordPress.com which is a blogging platform. Talking about blogging, that’s another way of getting your message out there to the wider world. If writing is your thing, then creating some unique content about your product or service, or related topics can help encourage interest in your business. If you want business support on how you can grow your small/medium business in Leicester or Leicestershire register at this page to see if you eligible for free advice from Collaborate. 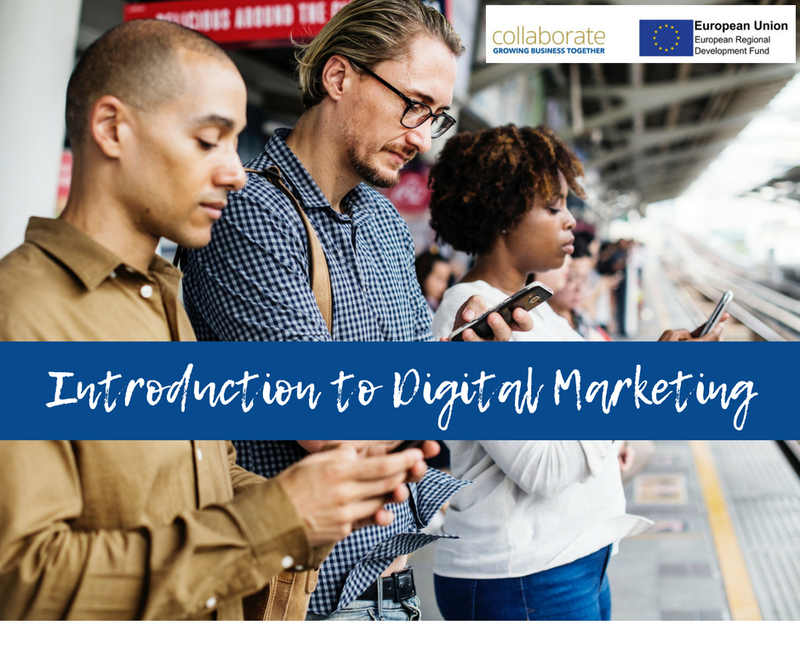 Digital marketing support, workshops and grants are available through the Digital Growth Programme. With seven out of ten small business owners citing cashflow problems as the main threat to their business, tips for ensuring a healthy cash flow could be the most important thing you read in the early years of business. Particularly for start-ups, experience shows that if you can’t manage your cash flow effectively in your first couple of years, it is unlikely you will survive. So, what does cashflow mean? It is exactly what it says on the tin, it’s when the cash flows in and out of your business bank account. 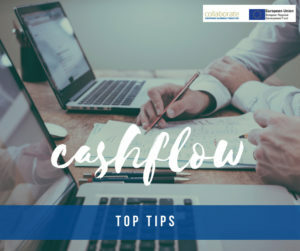 Keeping on top of your income and outgoings is vital and when developing a new business, preparing a cash flow forecast should be one of the first things you do. Estimate when you will need to pay bills and when you will be paid by your customers and have a plan B if your income doesn’t arrive precisely when you expect it to. Monitor that cashflow forecast regularly, it’s a working document and must be kept up to date as sales (income) and costs (outgoings) change – and they will! Make your terms of service very clear – that includes your settlement terms. Even with all those tips, sometimes those you have trusted can let you down, occasionally through no fault of their own – what do you do when someone is not paying? If the amount owed is greater than £5,000 you can serve a statutory payment demand formally requesting payment within 21 days. If this is not paid within that period, then you have grounds to present a winding-up order in Court. 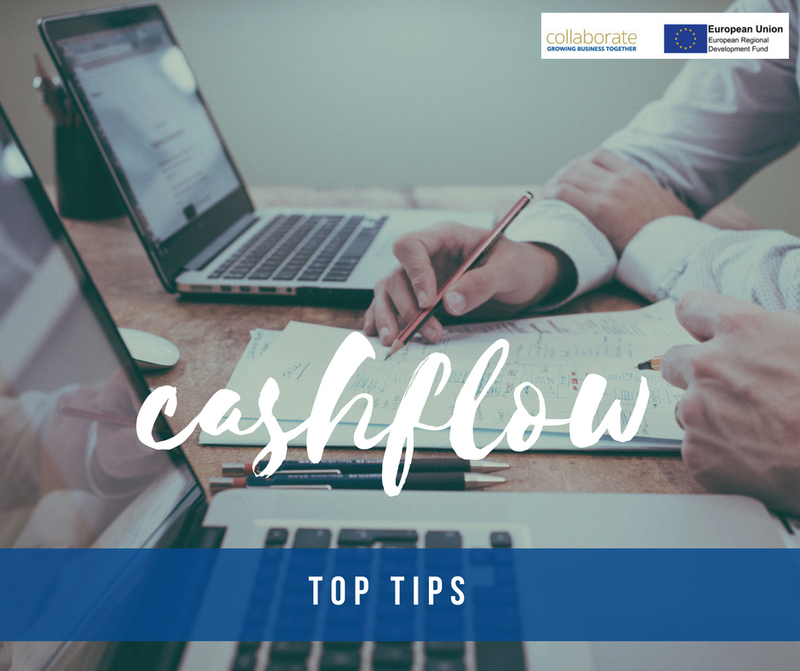 If you need help with cash flow forecasting or planning contact Collaborate to see if your business is eligible for 12 hours of free business advice and workshops. Visit this page and register now.